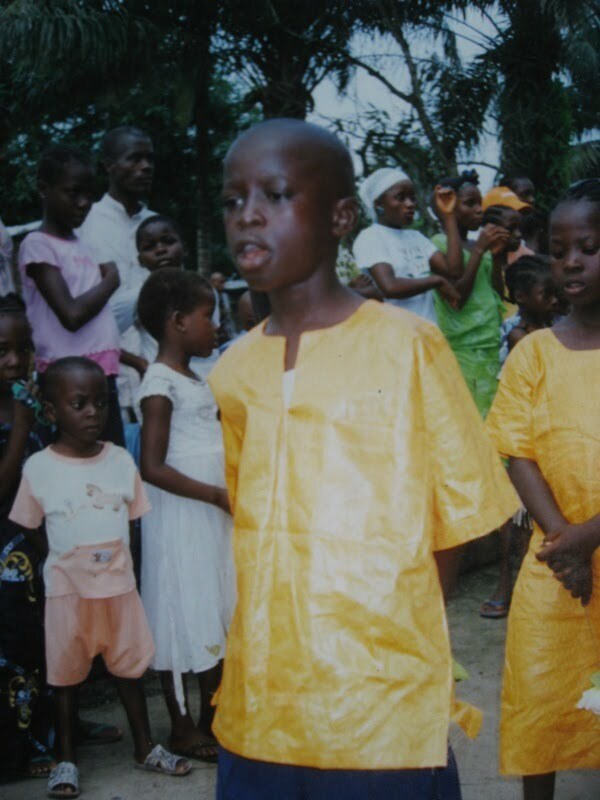 While most parents in Monrovia were “running after” school fees, uniforms and school supplies for their children – Nancy was wondering what would become of her son, Alfred. Last June, Alfred graduated from Kindergarten at the “top of his class”. As any proud mother, she looked forward to seeing how he would do as he continued with his education. What she didn’t know was how much their lives were going to change during the summer break. On July 26th, 2009, Alfred’s life changed forever! He was hit by a car and suffered injuries that have left him completely blind. All hope that his mother had for him came crashing down and she felt totally helpless. How could she help her son in a country where there are such limited resources? After a month long recovery at JFK Hospital in Monrovia, Alfred was finally released to go home with his mom. 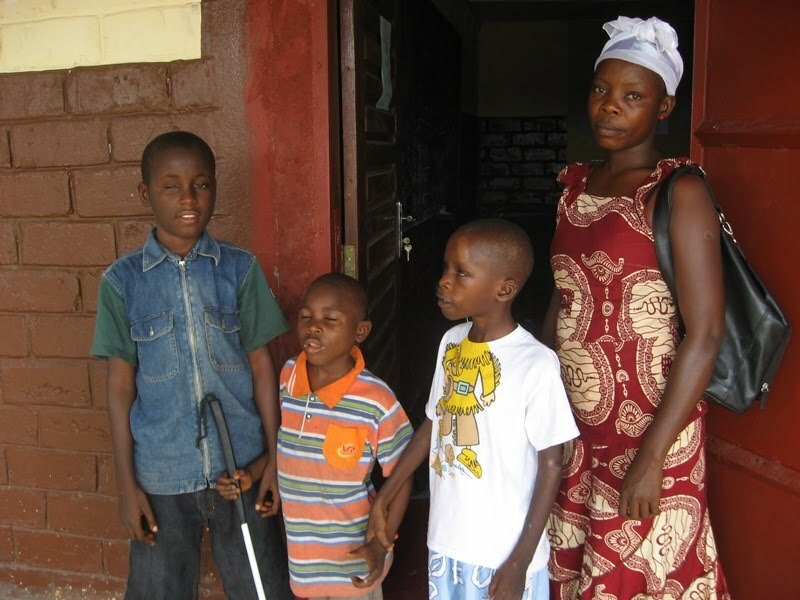 In desperation, Nancy took Alfred to Cooper Eye Clinic hoping that they would give her good news that a surgery could be done to restore sight for her son. When the doctor told her there was nothing that could be done . . . all she could do was weep. And as she cried Alfred reached out and said, “don’t cry mama, it will be alright – let’s go home now”. This quickly caused everyone in the waiting room to dissolve into tears at the amazing courage of this young boy. One of those individuals was Mamie who had taken another patient to the clinic for me that day. The following day, Alfred and his mother arrived at my house with Mamie to see if I could offer some hope. I was in the middle of teaching school to Kaitlyn and Kaleb so we took a break to meet them. Kaitlyn, who had just watched the episode of Little House on the Prairie when Mary becomes blind, was instantly energized to help Alfred. 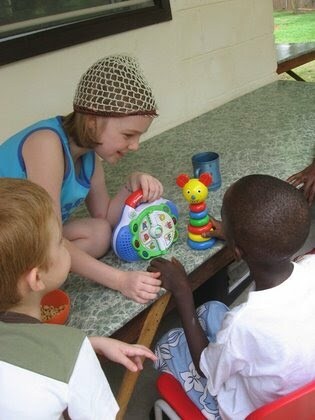 While I talked with Nancy, Kaitlyn went inside and found several toys that she thought Alfred could play with. As she brought them out and worked with Alfred I stood back in awe of my daughter and realized that God had given her a heart like mine. I smiled as I imagined what God has in store for her future and was once again thankful for the opportunity to serve here in Liberia. During our visit, Nancy began to cry saying she didn’t know what she could do for Alfred and wondered, “How could God allow this to happen?” Kaitlyn spoke up and said, “maybe God has a wonderful plan for Alfred – he has a special gift now.” Both Alfred and Kaitlyn had faith that God does have a plan and it brought a smile to Nancy’s face. 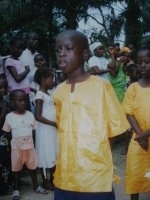 After a few phone calls I found out that there is a blind school here in Monrovia. Within 30 minutes we arrived at their door where we met many other children Alfred’s age that are also blind - but learning to live with their disabilities. For the first time, since the accident, Nancy had renewed hope. She was able to see other children that were able to function on their own and continue learning. Now she just had to trust that God would provide a way for Alfred to go to this blind school. If the funds were made available he would board there with other students and only go home during long weekends and Holidays. Nancy’s husband left her with 2 children and she braids hair in order to provide food for her family – but even that is hard to do some days. As I spoke with the administration, they agreed to give me some time to find sponsors for Alfred. The cost for his room, board and education will be about $500 for the year. As Alfred sat on our porch singing, “It is well with my soul” and an African song that says, “what man intended for evil, God intended for good” all I could do was smile and be amazed at his faith in God. Alfred has touched the hearts of our family and like Kaitlyn we believe that God has an amazing future for him. If you’d like to help be part of this future let us know.